Graded student papers all day, and by 2 p.m. Angus and I were looking at each other. “Is this the best we can do?” It’s one of the things I like most about having a canine best friend. You support each other’s habit. Not much paw- and arm-twisting necessary here. 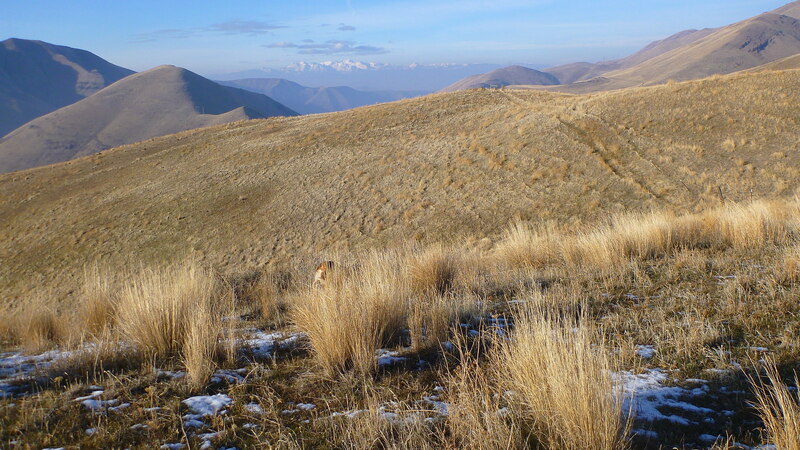 The fog had started to lift and the chukar hills morphed into recognition to the west. Ten minutes later we were on the road. After a 30-minute drive down into the icy canyon I pulled off at a place I’d never tried, and hiked straight uphill from the shadows to the light. It was cold and windy, and the snow had burned off, leaving the ground peanut-buttery. Lots of greenup, even more wind. The birds would be catching the fading rays in hollows out of the steady, icy wind coming from the southeast. 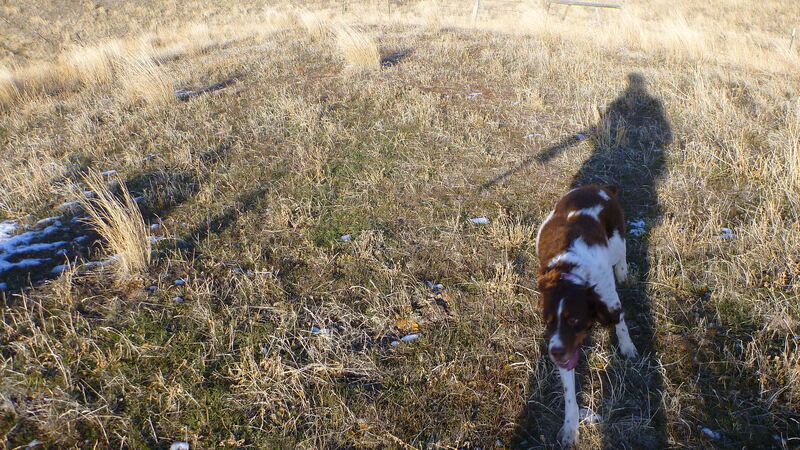 I got to the top of the first plateau, and was surprised that Angus hadn’t gotten birdy in the spots that looked good. They must be higher. Up we went. In the first hollow at the next level up Angus got really birdy, and a small covey of Hungarian partridges rose downwind of him. I shot once and watched three birds tumble to the ground. Bizarre. Angus got one, I snagged the other, and the third, which I think had only gone down because it got tangled with the other two, escaped (hopefully unharmed). Still, that’s a first for me. As if I were tempted to feel too proud of myself for the “augmented double,” catching the second bird cautioned me against it. As I reached down to grab the wounded Hun, writhing on its back, it shrieked, with its mouth wide open, like I’ve seen baby birds do waiting for regurgitated worms from a caring parent. But instead of giving it nourishment for a lovely life ahead I was ending it. I grabbed the frightened Hun, and she scratched me with her feet while I suffocated her and watched her eyes go opaque. I spent the rest of my time that spectral afternoon following Angus around as usual, hunting. I killed one more bird and saw lots more than I’ve seen in a single outing this season. And I’ll go out again as soon as I can. But I wonder how long I’ll want to keep it up. It’s weird to say that about your favorite pastime. Glad you got out. I did too but was skunked. Not having a dog is starting to take a toll. Destination and purpose, eh? As long as you eat that bird, one that has had a free-willed wild life, it is better than protein from the store. If I ever stop having these twinges of compassion, I think it will be time for me to stop hunting. What separates a good hunter from a sociopath, is the fact that we hate causing pain, even though the death of our quarry is the ultimate goal. It is a paradox that only another like minded hunter could understand. Enter your email address to follow this blog & get email notifications of new posts.